I’ve been following Amplify‘s authors Katie Muhtaris and Kristin Ziemke for some time now, through Twitter, their blog and their work with Stephanie Harvey in Connecting Comprehension and Technology, so I had a feeling that their new book would offer just the guidance I would need to feel comfortable and confident in moving forward with digital teaching and learning in my sixth grade classroom. All children can learn. We have countless opportunities each day to invite kids to do the work and build understanding. Leveraging technology is one way to make that happen. Technology gives kids access and amplifies opportunities for interaction. In a digital conversation, every student participates; no one is left out. The technology is as transformational as we make it. It’s not the tool that counts; it’s what we do with it. *Incorporating a mindset for technology within a workshop framework of best practices. *Exploring ways in which we can connect students (and ourselves, their teachers) to powerful learning opportunities outside the four walls of our classrooms and school libraries. *Being explicit in how we introduce and teach our students new digital formats and ways of interacting with digital texts. *Specific lessons to foster independence, i.e. ” developing a mindset for becoming a digital citizen and establishing basic care and management procedures”. *Forming authentic tools with which to assess our students’ learning and build reflective practices into digital learning. *Foster inquiry across the curriculum and a global stance towards learning – what can we both learn from and teach to other students? Amplify was just the book I needed to read at this stage of my teaching life; it gives me just the types of scaffolds I need to move both my students and myself forward in digital literacy. Every classroom discussion, every digital interaction, is an opportunity to help children take their first steps into the global community, to see and define how, why, and when technology can be a vehicle for change. This increased interconnectivity sets the stage for students to develop deep compassion for one another and be upstanders in their community and the world. This is empowerment at its very core. Kids can own their learning, and technology is just one tool to get is there. #CyberPD is an online professional development learning community where teachers read and discuss a common professional development text. Visit Reflect & Refine for more details and links to connect with the group. 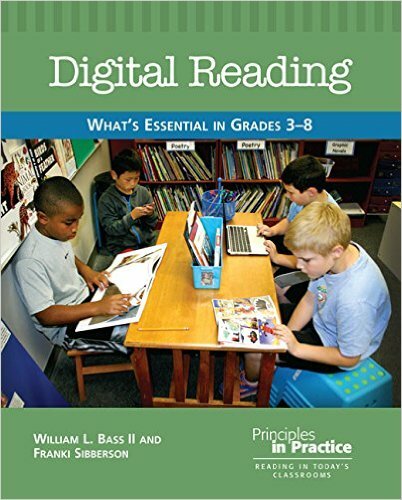 This year’s book isDigital Reading: What’s Essential in Grades 3-8 by Franki Sibberson and Bill Bass. Tuesday, July 28th @ 7pm CST: #cyberPD Twitter Chat: Chat with authors Franki Sibberson and Bill Bass. I had two takeaways for this chapter. First, I need to reformat my first week of school reading survey questions to incorporate digital reading questions as well. The questions Franki shared on page 87 were comprehensive, and I would only add a question that tries to ascertain what a student’s habits are when it comes to searching digital media for information: it is hit or miss? or has the student already figured out a way to do this and can the student then share his or her techniques with the class (and with me!). I loved the idea of doing this on Google Forms, so that it can become part of the student’s portfolio for the year. We began having access to Google Classroom and Google Drive half way through the year, so I did not have a chance to present exactly how it was all going to work to my students’ parents on back to school night. The truth is, I didn’t know how it was all going to work, either – and many lessons were learned from January to June! This is exactly what I began to see happening in our classroom last year – the goings on in our classroom were much more visible to parents because everything was accessible online, via our Google Classroom pages, or our work on Google Docs for a variety of purposes. It is a well-known and well-worn truth that our children rarely communicate about school work beyond: “nothing much”, “I don’t know”, and “I can’t remember”. It was incredibly helpful for parents to know that they could access resources to see for themselves what and how learning is taking place in their child’s day. I love the idea of weaving in Google Calendar, too, so parents can be part of the process of teaching kids how to manage their time and prioritize their work. As a middle school teacher, this is a critical goal – and I know that it is important to have my students’ parents on my team. I’ve come away from reading this book with concrete goals and ideas for next year; I keep coming back to the word intentional – I think I’ve learned that intentionality in digital literacy comes from practicing it ourselves, learning from the experience, and figuring out how to embed it in all we already do. We want our kids to have that holistic goal: “we want our students to be active communicators in the complex world they live in.” (page 110). I’m looking forward to the Twitter chat!